When The Clone Wars did a droid-focused arc, for the most part the show maintained a scrappy, oddly-appealing tone to keep the audience’s attention (we’ll just ignore that “Void” arc). Watching R2-D2 escape a number of scrapes was amusingly exciting. The interplay between said droid and C-3PO was cliche but fun. And most importantly, the show established a strange but effective bond between Anakin and R2-D2; both would go through some crazy adventures to save the other, nonsensical human/droid dichotomy be damned. (If I remember correctly, Ahsoka actually questions Anakin on this, and his reply acknowledges the oddness of their relationship while emphasizing the friendship.) The problem with Chopper and AP-5 is that they have no core connection like that to anyone in the Ghost crew. This is strange because Chopper, in particular, should have that kind of Anakin/R2-D2 connection with Hera. 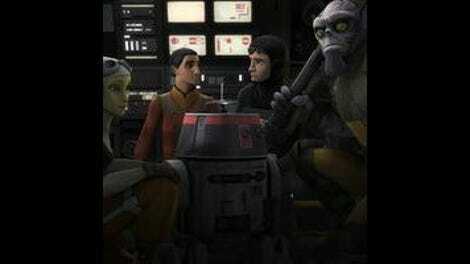 (She rebuilt him when she was young during the Ryloth wars and stuck with her ever since.) Heck, the episode ends with Hera enacting deadly revenge on the figures who hacked her droid in the first place. But until that point, she’s barely in present in the story. 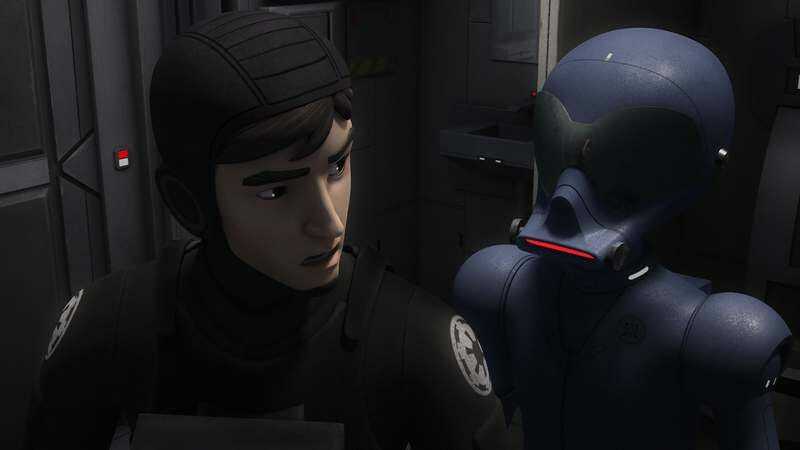 “Double Agent Droid” is a strange episode of Star Wars Rebels. It’s not as dire as “The Forgotten Droid,” which was hurt by lousy direction and stilted writing more so than Chopper’s irritating characterization. Writer Brent Friedman seems to be aware of that, and the overall charisma-lacking energy the droids bring to the show, so he presents an episode that feels almost experimental in its execution. He primarily executes this via Controller (voiced by Josh Gad), a robotic villain of singular focus who mans a crew of… rogue-like Imperial techs seeking to discover the rebel base. And, wow, these guys are weird–a far cry from the traditional baddie-types the show has used. There’s some broader implications here, which I’ll get into later, but they make for unique antagonists for sure, which is a step in the right direction. The use of Wedge is understandable outside the script itself: anyone in the Ghost crew would’ve recognized Chopper wasn’t acting himself. Still, it’s hard to buy into the narrative decisions, particularly when Hera takes over the second half. It should really have been her story from the beginning. Once she realizes the truth (and avoids being sucked out into space), she develops this anger, derived from what feels like a sense of a deeply personal slight: “They wanna mess with my droid, they’re gonna pay for it!” she says in stark assertiveness. It’s a sensibility that, frankly, feels disingenuous, since in three entire seasons Hera never really presented herself as being that protective of good ol’ cranky C1-10P. Certainly not so much as she would reverse-engineer a power spike of energy to the point that she’d blow up and kill an ship of Imperial dweebs. It’s extreme, although I suppose it’s silly to feel bad for Imperial villains in any sense. But its severity comes from nowhere. Hera’s righteous anger surges within the span of ten minutes, not as the result of a several-year bond between her and Chopper. The emotional connection is weak, but the narrative oddness was strong, so I guess we can call this a wash? It’s the best you can say for any droid-centric story, really. Is it Star Wars canon that bathrooms are referred to as “refreshers”? Like has that been used in comics and video games? Although, rewatching this episode, it seems more likely this group of geeks decided on their own to go after Chopper and the rebels. Which is also a welcome change of pace. Imperial rogue nerds? I’m all about that. I wish they weren’t killed. Humans acting like stubborn droids and droids acting like stubborn humans. That’s about the most obvious parallel symbolism you can get. But it worked, so I can’t be too harsh there.